We received an inquiry asking what "single estate" means and whether our tea is single estate. Here is the answer we sent. All of our tea is single estate, meaning a single artisan grows it, harvests the leaves, and crafts the leaves into tea. The term "single estate" is to distinguish from teas where a tea-processing operation buys harvested leaves from various outside tea farms. Our growers, in contrast, are complete, start-to-finish establishments: the artisans plant what they harvest, harvest the tea themselves, and use *only* tea leaves harvested from their own land. Single-estate tea artisans are the biggest sticklers in the tea world -- they don't trust any tea leaves they didn't grow themselves. There is a practical reason for this: there is no way to truly assure tea quality unless you have overseen the entire process, starting with planting and caring for the tea plants yourself. Please let me know if you have any other questions. Thank you again for contacting us. You can read more about our growers here. 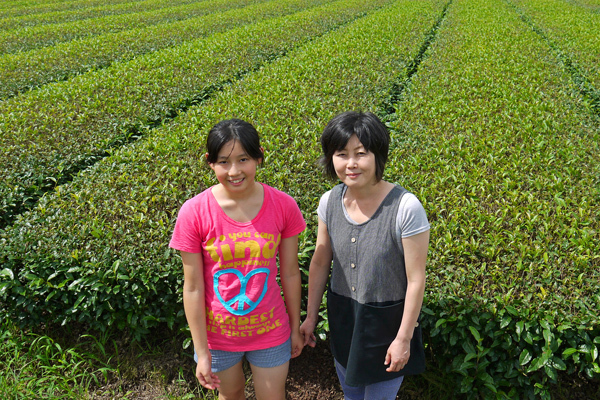 A mother-and-daughter pair of growers in one of their tea groves. All of their tea — including, of course, what they provide to Mellow Monk — is single estate.